Vietnam provides the perfect mix for anyone considering a new challenge – beautiful scenery, great food, a rich culture and wonderful people. A country on the rise that has a world of adventures to offer. There is surely something for everyone here, bustling cities to calm and peaceful countryside Vietnam really does offer a wide range of lifestyles. Unfortunately a sad and war-torn past still haunts this amazing country and poverty and social exclusion are rife in certain areas. Our goal is to bring the joy of life to these areas. 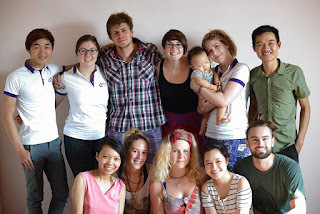 Our projects aim to bring you closer to the vietnamese in need of your skills and experience. Looking to branch out from Hanoi we have partners in remote areas all around the capital. We are aiming to fill the void in the more secluded areas to help share the enthusiasm that travellers bring. Joining us in Vietnam isn’t all about the people we help; it is a rich and rewarding experience for the people travelling here too. Our people are exposed to a side of Vietnamese life that tourists and backpackers just don’t see. Our volunteers and teachers work closely with Vietnamese people and can sometimes find themselves living with Vietnamese host families. Bordered by Cambodia, Laos and China, Vietnam is arguably the jewel in Southeast Asia’s crown. Lush landscapes, a stunning coastline and vibrant cities make this a very special place to spend time. All of our projects are located in and around Hanoi north Vietnam. Depending on the project you will always find yourself taken care of and living in suitable conditions according to your needs. We consider our people as family and always stay in contact. Once you are part of the Mercury family you will always be a member. We hope you will join us soon and keep this great work moving forward.